If you are a regular visitor or reader of DailyBlogging, you would know that a couple of months ago I had announced that there will be some reward for our awesome commentators i.e. in the form of a banner image (Size : 125*125). We call it the ‘Top Commentators Award’. This month we have two new winners for this award. I’m happy that March’s Award winner also took some time off & commented despite of the fact that they’d won a banner slot each. So without further ado, The Top two Commentators are Zohan (14) & Ravi Shankar (13), who’ve got a wonderful banner slot to advertise their blogs/sites and thereby get some exposure and clicks. Hard luck to the other participants. 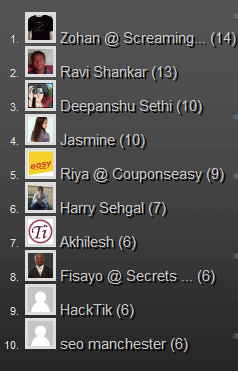 But don’t get too disappointed because you are already getting some link love from the Top 10 Commentators widget. Above is the image taken for the sake of proof. Both of them have been informed to send their 125*125 Banner image as soon as possible. In case you didn’t receive my mail, then you can always send the image via our contact form. Hope to see more quality comments again this month. Wish you luck! If you are a new visitor & reading our posts for the first time, then Subscribe to Our RSS Feeds / Daily Updates. Wowa !! I won thanks for the wonderful reward mani, i’ll be sending the banner soon. Congrats to the winners. Good job Mani. I like that you reward those who take the time to leave a comment on your website, I think with this reward system you currently have it makes it so that others are more willing to comment on your website!